Well OK, you asked for it. 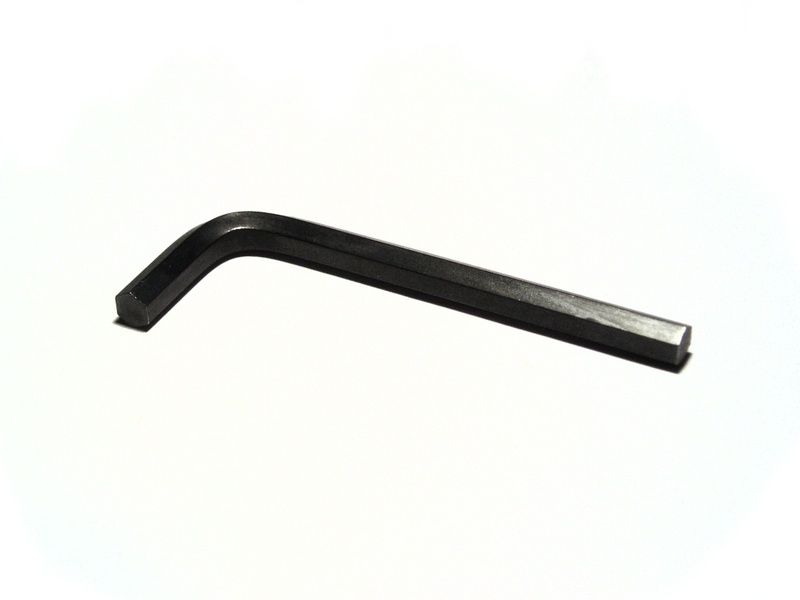 It’s an allen key (not a crowbar, in case you were wondering about the scale of the image). It is about 4cm long and until very recently – about an hour ago in fact – it lived in a small compartment in my roll-along briefcase. Occasionally it would come out of hiding to tighten the wheel bearings on the briefcase and then return to its familiar home. It is a modest and retiring creature, completely unaware that it is in fact a dangerous weapon. Fortunately for me and my fellow passengers now flying at 35,000 feet above the earth on a BmiBaby flight from Birmingham to Malaga, its lethal nature was recognised in seconds by the eagle-eyed security operative on the X-Ray machine in Departures. It was hopeless. My pleas not to be separated from my little friend fell on deaf ears. But as I took my seat on the aeroplane, I consoled myself with the grateful realisation that the security operative had saved me from my baser nature. I had forgotten that the allen key was in the bag, but once I knew it was lurking there, he was of course quite right to remove it from my possession. When you come to think of it, I might easily, in a murderous rage at having to pay £2.50 for paper cup half full of a luke warm liquid that could not even pass for tea in a coffee competition, have forced open the window, reached out and unscrewed the wing. I might have placed it in the aisle as a barricade and taken a member of the cabin crew hostage behind it. I might have placed it in my open palm and terrified the passengers by showing them that I was armed. I might have hurled it across the cabin, thus creating a severe imbalance in the loading of the plane and caused it to veer into a mountain. Oh yes, its potential for causing death and destruction was nearly limitless. But what’s this? As I write these very words, there is an announcement over the public address sytem: the pilot’s prosthetic limbs have loosened and fallen off in the recent turbulence; he cannot fly the plane; does anyone have an allen key with them with which to screw the limbs back on and save the day? Under the circumstances, I am surprised that my final thoughts are so benign. Of course he would enjoy writing the reports. That sort of half-assed, pettifogging, literal-minded, dim-witted, jobsworth generally does. But apart from that, Geoff, he was alright? Ha, ha! Love your last sentence – there’s something so exhilarating about exasperation when it’s cogently expressed. Whereas I flew back from India yesterday with a pointed nail file, nail clippers, a cuticle trimmer and no one said a word. Must be the way you look!